When drivers go looking for a new vehicle, they want one that offers all of the latest gadgets and technology. For this reason, the Smithtown Volvo Cars team often recommends the new Volvo XC90. A quick look at its list of audio technology and tech features will reveal why this luxury SUV is one of the most popular in its class. Drivers are sure to love the XC90's graphical heads-up display system. This feature presents the driver with vital information such as speed and navigation information right in front of the windshield. This means that you won't ever need to take your eyes off the road to know how your trip is going. 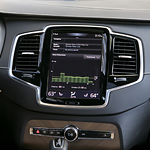 The XC90 also offers a high-end voice control system. This feature allows the driver to change the song, get directions, turn up the volume, send a text, and much more without ever needing to take their hands off of the steering wheel.